I preface this by saying you can bullet journal inside ANY notebook – the Bullet Journal is a system, not a specific book. Ryder Carroll, the creator of the system, meant for this system to be used anywhere, whether that’s a 50 cent composition notebook or a $20 imported beauty. For some, any notebook will do, and for others like me, looking for notebooks you like is a fun thing that enhances the system as a whole. 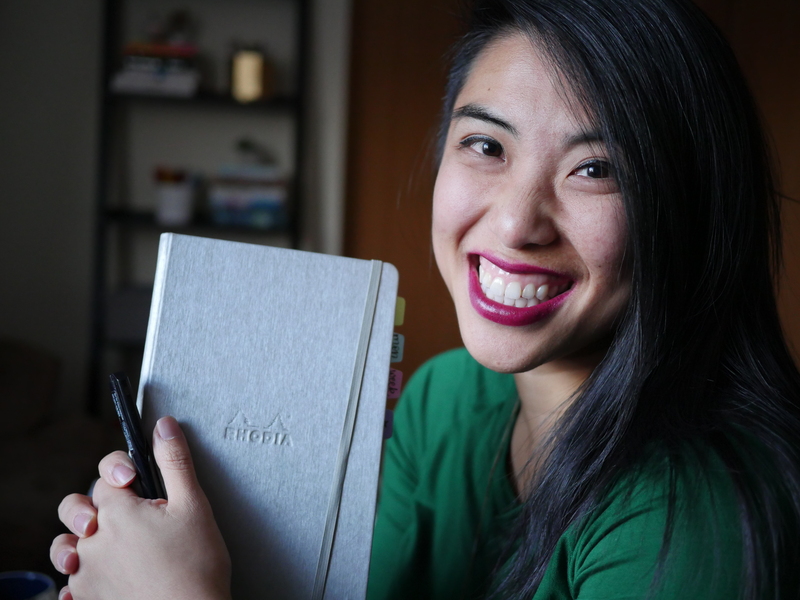 Today, I’m reviewing the Red Co Dot Grid notebook – this is not a brand I have heard much about, so I was excited when they reached out for my thoughts. I’m always looking for other options besides the ever popular Moleskine and Leuchtturm options! Note: This post contains affiliate links, which means if you happen to purchase something, I make a small commission that goes back into giveaways, reviews, etc on the blog. This is a sponsored post by RedCo, but my thoughts and opinions are always honest and my own. Thanks for your support! The cover is soft to the touch and is closed with an elastic in a corresponding color – you can see (hopefully) that it is a mid-way between a soft cover and hard cover. There is structure to make you feel okay throwing it into your bag but enough give for it not to be rigid. The material is supple to the touch, like a fake leather. Leuchtturm Bullet Journal fans, be delighted!! Because this notebook features an Index AND page numbers throughout. The dots are light, which can be a plus if you like to take pictures of your pages or scan them into your computer. You can also see the pages are slightly off-white – the same tinge of cream like the Leuchtturm, actually. Other features worth mentioning are that it lays flat because of the way it’s bound, has TWO ribbon bookmarks, and a back pocket for your papers or other embellishments. The most important part, the pen test. For some, the notebook matters the most so you would adapt the pen you’d use; for others, the pen experience matters the most, so you’d adapt the notebook to meet that need. I tested an arsenal of my black pens (more to come on those, I promise) to see what would ghost and bleed. The notebook claims it is acid-free and fountain pen friendly, so let’s put that to the test. For the most part, there is NO bleeding – except for the bottoms of the Lamy Safari extra fine ink. If you write quickly, that won’t be too much of an issue – but if you are a slower writer, the ink has more time to bleed and ghost. Generally, the ghosting (where you can see the ink through the back side of the paper) is fine. The most obvious ghost-ers (not people who stop talking to you) are the Sarasa 0.7mm because it’s SO inky, the Supertips, and the brush pens – which is to be expected since they are markers. But honestly I’m not bothered by that in this notebook, compared to the Leuchtturm. Overall, I was pleasantly surprised by the Red Co dot grid notebook (RedCo // Amazon) – I think the biggest hurdle for me honestly is the size! I’m so used to the A5 size that shifting over to a smaller size would be a transition. But I love that the pages are numbered, that the page quality seems better than the LT, and that there are so many fun colors. Do you think you’d give it a try? Is it missing anything you’d want in a notebook? Let me know in the comments! Because you mentioned the smaller size a couple times, how many columns and rows does it have per page? 23 columns and 34 rows! Thank you for sharing this company. I checked the site for Red Co. Fun. Maybe for my next notebook, something different. P.S. Don’t hate your hands. Be thankful you have them and they work. I’m starting my Red Co in May. It is pink. I’m also wondering if the size will bug me. How is the size so far? Thanks for the review! I noticed you wrote with the Pilot Metropolitan, was it a fine nib or med nib? I have become one of those people that has fallen in love with my pens and the notebook/paper needs to be good for my new found love of fountain pens. I am obsessed! I have one fine nib on my Lamy Safari and all the rest of my pens are med nibs. Thanks again for the review! I prefer fine because my handwriting is already so sloppy!